Chiyoda approaches the design, procurement and construction stages of every project with consideration for the nvironment. Improving on the plans provided by our clients and proactively engaging in environmental proposals, we aim to construct plants with a lower environmental impact. Over the past five years we have submitted an average of 322 proposals annually. In FY2017, 197 proposals were accepted by our clients. Our project procurement operations are implemented on our green procurement guidelines based on the Ministry of the Environment’s Green Purchasing Law so that we utilize construction materials and construction methods with less of an environmental impact. 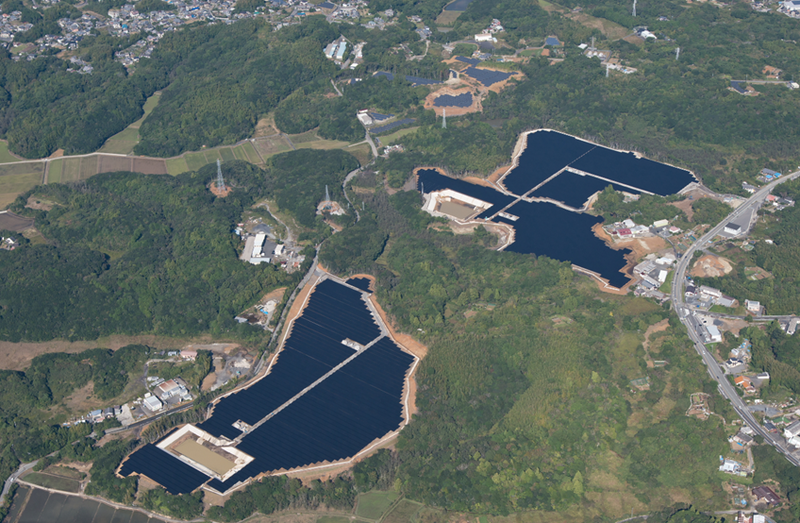 In December 2017, Chiyoda completed construction of the Shima City Ago Tategami Mega Solar Plant (12.8 MW) for Sanco Real Estate Co., Ltd. The plant is located in Agocho Tategami, Shima-shi, Mie Prefecture. The Japanese government’s Basic Energy Plan positions photovoltaic power generation as a key energy source that is supposed to make up 22-24% of renewable energy by 2030. Chiyoda has been involved in the design and construction of approximately 29 mega solar plants to date, and when the power plants currently under construction have all been completed, they will generate a total of 460 MW. It is estimated that the greenhouse gas emissions reduction effect will be equivalent to approximately 4.5 million tons* by 2040. We will continue in the future as contractors providing design and construction services to meet the needs of our customers that promote carbon-free projects. 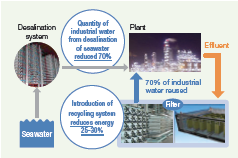 The Chiyoda Group implemented a demonstration project entrusted from NEDO (the New Energy and Industrial Technology Development Organization) for wastewater reclamation system at the Dammam First Industrial City established by MODON (the Saudi Industrial Property Authority) in Saudi Arabia, which has a high level of water stress*1, after carrying out a risk assessment and feasibility study. As an initiative in the water recycling field, we implemented a demonstration project for wastewater recycling system technology at the Dammam First Industrial City, which is operated by MODON. The project demonstrates a system that achieves an energy saving of approximately 30% over conventional methods of seawater desalination. The project treats approximately 5,000 tons of wastewater per day using membrane technology (MBR*2 and RO*3 membranes), and reuses 3,500 tons of industrial wastewater. The project country has limited water resources, so promoting the recycling and reuse of industrial wastewater contributes to the effective use of water resources. Implementation in other water stress areas is anticipated. *1: Water stress is an indicator for evaluating the extent of strain relating to water supply and demand, and is expressed as the usable quantity of water resources per capita of population.